“Miracle” is a term which is often applied to many aspects of the space program: to Yuri Gagarin’s pioneering flight to the accomplishment of the first manned lunar landing or to the safe return of Apollo 13. 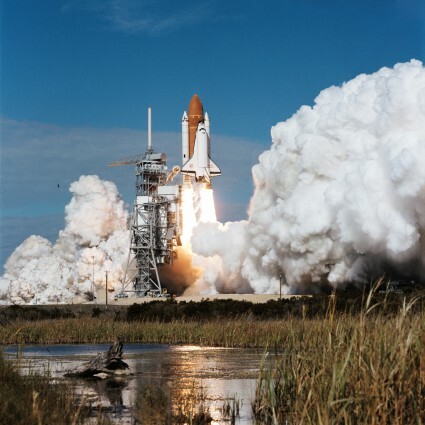 But the launch of Space Shuttle Discovery in January 1985 on Mission 51C marked a miracle of another kind. In a sense, it was quite literally miraculous that the orbiter made it into space at all … both metaphorically and literally, as the Challenger accident investigation would later reveal. When astronauts Ken Mattingly, Loren Shriver, Ellison Onizuka, and Jim Buchli were named as the crew of STS-10 in October 1982, they confidently expected to launch aboard Challenger in September of the following year on the first classified mission for the Department of Defense. It would put the shuttle’s advertised ability as a “truck” for the United States’ largest and most sensitive national security sentinels to the ultimate test. Since the conception of the manned spaceflight engineer programme, the intent was to fly a dedicated officer aboard each classified flight. For Mission 51C, it would be Air Force Major Gary Payton (back left). 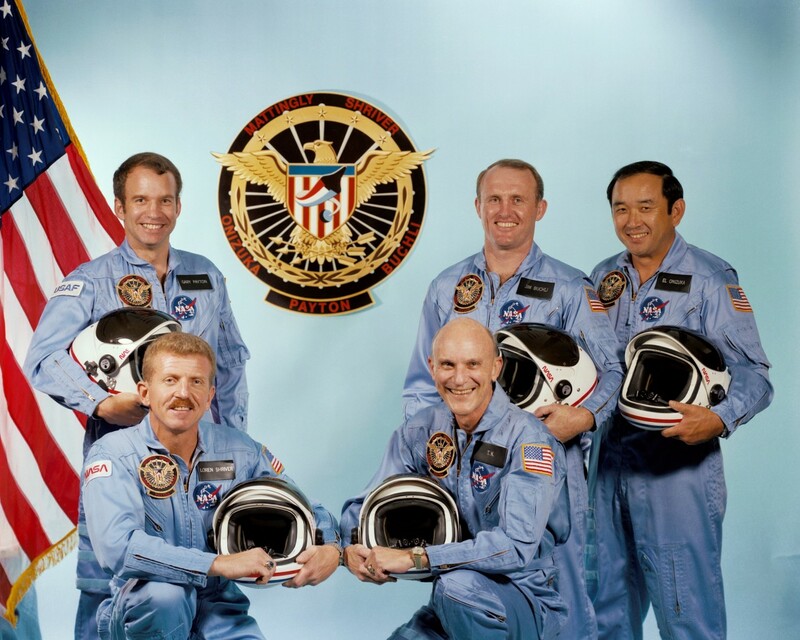 The other NASA crew members were Loren Shriver (front left) and Ken Mattingly (front right), with Jim Buchli and Ellison Onizuka behind (Credits: NASA). 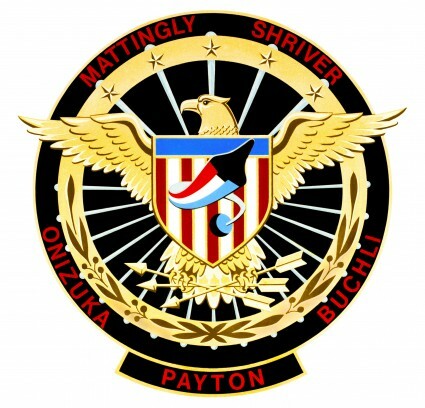 It became a staple of each Department of Defense mission for a patriotic crew patch, with little indication as to its primary objective (Credits: NASA). The ridiculous levels of secrecy became even more laughable at other times, particularly when the astronauts were obliged to “disguise” the places where they were doing their training. They would file T-38 flight plans to Denver, then file new ones to the San Francisco Bay area, then rent a car to eventually reach their military destination at Sunnyvale in California. They were asked to do their mission training during the daytime and at night, to keep the launch time secret from prying eyes, or anyone who could be bothered to put two and two together, but all this furor never convinced Mattingly than anyone really cared. 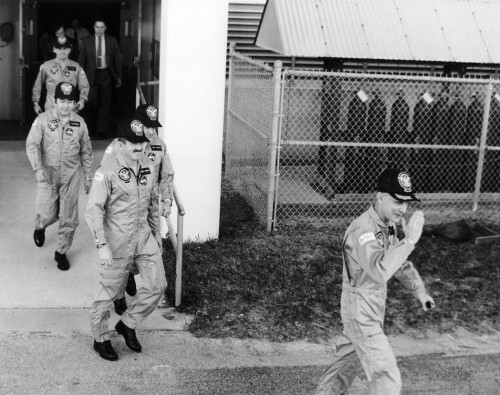 On one occasion, their office secretary booked motel rooms for them—”secretly,” of course—but the four astronauts, crammed into a decrepit old rental car, with Ellison Onizuka at the wheel, had a surprise when they arrived. Jim Buchli spotted it first. When the countdown clock began ticking, nine minutes before launch, it must have caught the assembled spectators by surprise. Mission 51C was indeed the quietest human launch ever conducted by NASA, a fact which sat uneasily with Public Affairs staff and public alike (Credits: NASA). In one of relatively few images ever publicly released from Mission 51C, astronauts Loren Shriver (bottom), Ellison Onizuka (left), and Jim Buchli pose for a photograph in Discovery’s flight deck (Credits: NASA). Commander Ken Mattingly (right) had already announced his retirement from NASA to return to the U.S. Navy by the time Mission 51C took place. By his own admission, only the first shuttle mission from Vandenberg Air Force Base might have encouraged him to stay. A year later, the loss of Challenger sounded the death-knell for shuttle flights from the West Coast (Credits: NASA). 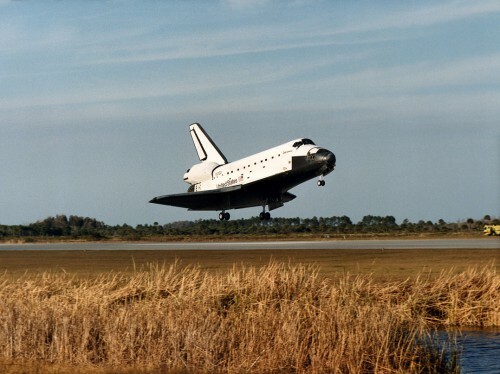 Discovery touches down at the Kennedy Space Center on 27 January 1985, following the shortest operational flight in the shuttle’s 30-year history (Credits: NASA).